Good morning. It's Friday, Nov. 9. • Wind-driven fires destroy one town and threaten others. 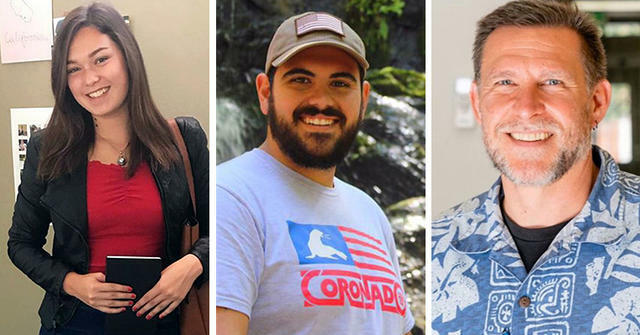 • Stories of the lives taken in Thousand Oaks. • And how the banana slug became a celebrated mascot. A wildfire tore through Paradise on Thursday. An out-of-control fire roared across the Sierra foothills east of Chico on Thursday, destroying as many as 2,000 structures and forcing more than 30,000 people to flee for their lives. The Chico Enterprise-Record said there were reports of multiple deaths. 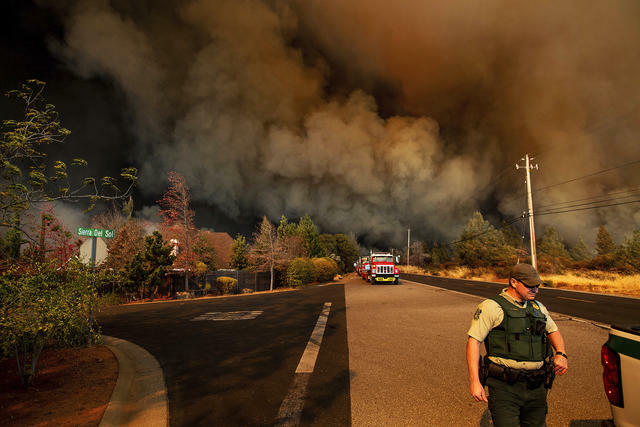 "Pretty much the community of Paradise is destroyed," a Cal Fire official told the A.P. "It’s that kind of devastation." The so-called Camp fire erupted in the morning then grew with howling winds to more than 30 square miles, consuming Paradise, a town of about 27,000 people. Chaotic scenes unfolded of homes and businesses swiftly engulfed, utility poles toppled, and people abandoning their cars on foot. Hundreds of crews attacked the blaze from the ground and air as people frantically tried to account for their loved ones. By early Friday, the inferno was within two miles of Chico and still raging uncontained. Read the latest at the Enterprise-Record and Sacramento Bee, and see a live fire map. At the other end of the state, two wildfires were bearing down on residential areas of Ventura County, where people were already reeling from a deadly gun rampage a night earlier. More than 30,000 people were advised to evacuate as chopper camera footage showed homes consumed by flames in the community of Oak Park. Alaina Housley, Justin Meek, and Sean Adler. • Alaina Housley, 18, was a promising student at Pepperdine University with dreams of becoming a singer. Her uncle called her a "beautiful soul." • Justin Meek, 23, was a bar promoter known for cracking jokes. He helped kids with autism and sang in a quartet. "He was a hero every day of his life," a friend said. • Sean Adler, 48, was a father of two who had recently opened a coffee shop, a long-held dream. On one of its wall, a sign read: "Collect moments, not things." Jason Coffman spoke to a gathering of reporters in Thousand Oaks. "You all know that I've been here fighting for him all morning long, and we did just get the news that he was one of the 11 that were killed last night. His name was Cody Coffman, my first-born son." Jason Coffman gave an utterly heart-wrenching account of learning about the death of his 22-year-old son. NBC Los Angeles | A.P. 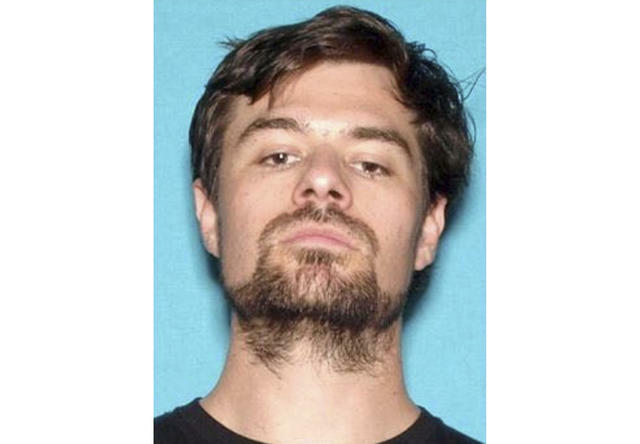 Ian David Long in a 2017 photo from the California Department of Motor Vehicles. • He joined the Marines at age 18 and saw combat as a machine gunner in Afghanistan. More recently, he was studying athletic training at Cal State Northridge. • He had moved into his mother's home in a quiet Ventura County suburb. They fought repeatedly, with him cursing so loudly that it would awaken the neighbors. • A neighbor called the police last April when it sounded like Long was tearing his house apart. A mental health team concluded there was no need to take him into custody. • He was described as a loner and "agitator" who picked fights during high school. "He wasn’t a very happy kid," a former coach told the L.A. Times. "I always try to make kids smile, and he never did." 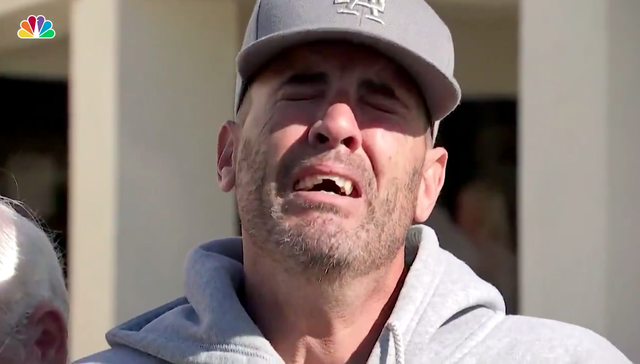 Man who watched the first shots and escaped, sobbing: "I should have stayed. I apologize to anybody who got hurt ... I'm sorry." Reporter: "There's not much you could have done in a situation like that." Man: "They're all young. I'm 56. I lived a life. They're all young. This shouldn't have happen to them." 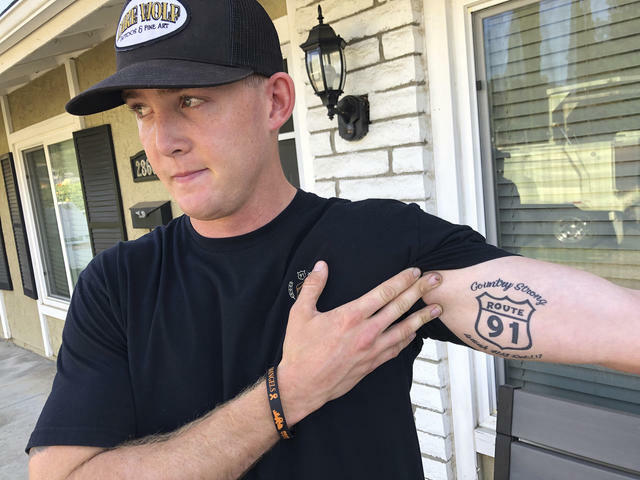 Brendan Kelly showed a tattoo memorializing the Las Vegas shooting. He was at Borderline Bar and Grill on Wednesday night. "I can't believe I'm saying this again. I'm alive and home safe." The Borderline Bar had been a safe haven for survivors of last year's massacre at a Las Vegas country music festival. They found themselves in a terrifyingly familiar scene Wednesday night. The mother of a 27-year-old man killed in the latest attack reacted with grief and rage. "Here are my words: I want gun control," she said. "I don’t want prayers. I don’t want thoughts." People gathered for a vigil at the Thousand Oaks Civic Arts Plaza Thursday evening. "However long the dark, the dawn will break." 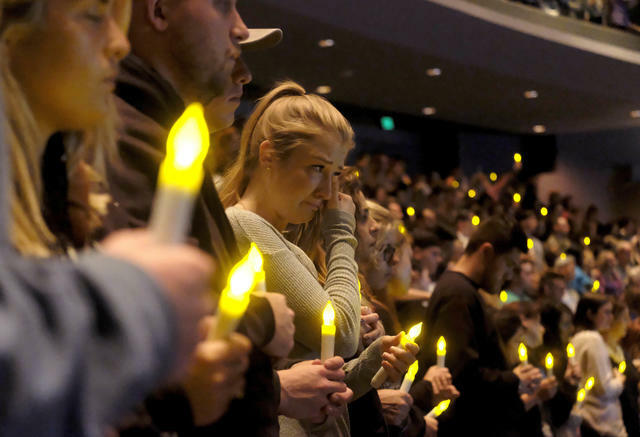 Hundreds of people gathered at a Thousand Oaks theater to remember the victims and wonder how one of the safest cities in America could become a killing zone. Outside, the hymn "Amazing Grace" rose from a prayer circle. California has some of the country's strictest gun laws. Still, Gov.-elect Gavin Newsom on Thursday said he would "raise the bar" on gun control. "There are a number of things he vetoed that I would not have vetoed," he said of Gov. Jerry Brown. "And there are a number of things that I want that haven’t been done." The spotlight on Christine Blasey Ford has receded since she accused Supreme Court Justice Brett Kavanaugh of sexual assault. But the danger has not. Ford said she has moved four times, paid for a private security detail, and been unable to return to her job as a professor at Palo Alto University in the face of continuing threats to her safety. "One of the loveliest ads made about California." The state's public utilities commission is airing a new ad that features the state's natural and cultural treasures. The message: Care for them by reducing your energy consumption. Edward James Olmos got a little choked up while doing the voiceover. "He's a native Californian, so this really connected with him," the director said. 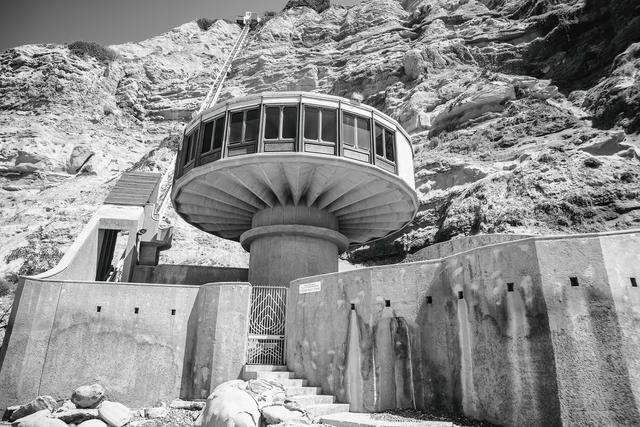 Alamere Falls spills onto Wildcat Beach. 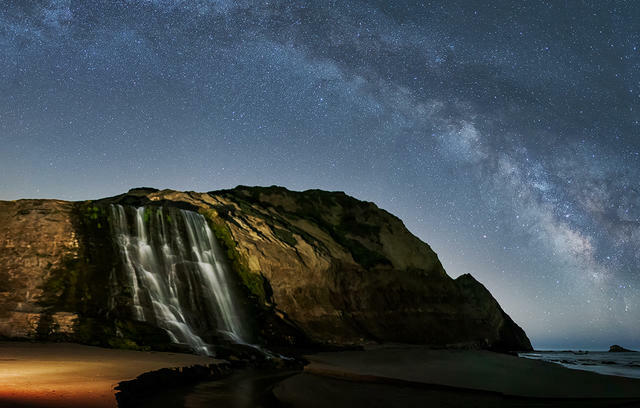 Alamere Falls, in Point Reyes National Seashore, is among the rare California falls that feeds right into the Pacific. To behold the gorgeous 40-foot cascade, you have to earn it. The most popular route is 13 miles roundtrip, and offers rewards of its own: lush pine forest, backcountry lakes, and dizzying coastal panoramas. 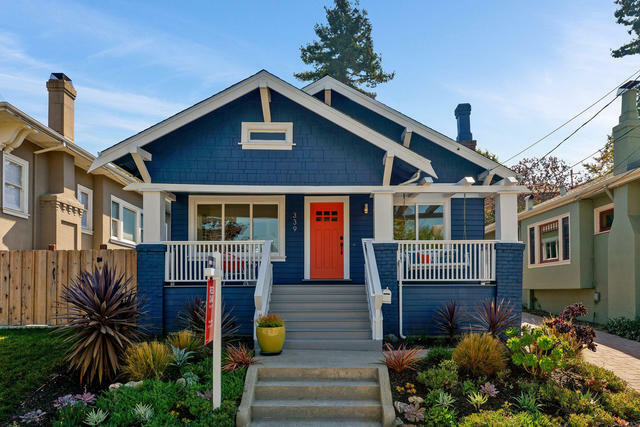 A two-bedroom 1913 cottage is on the market for $949,000 in Oakland. An 1865 Italianate Victorian surrounded by farmland in Michigan, a contemporary-style glass house on an island off Maine, and a Craftsman cottage in the Rockridge neighborhood of Oakland. Here's what $950,000 gets you right now. 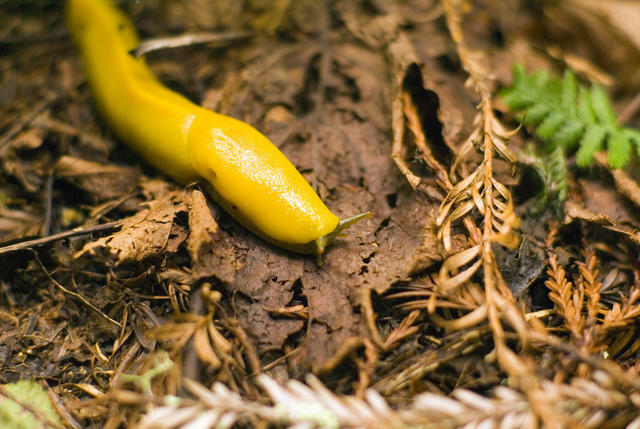 The banana slug is native to the forest floors along North America's Pacific coast. In the early 1980s, students at U.C. Santa Cruz embraced the banana slug as their unofficial campus mascot. Even so, when the university's sports teams were invited to compete nationally by the NCAA, the chancellor, Robert Sinsheimer, chose the sea lion instead. But the pro-slug forces refused to slink away. The second largest slug in the world, the unassuming mollusk is a familiar sight around Santa Cruz's forested campus (the alma mater of your humble correspondent). Its veneration by the students was meant as a countercultural poke in the eye to the tradition of fierce mammalian mascots. "The slug represents our uniqueness and our resolve to stay that way," 21-year-old Eric Satzman told People magazine at the time. In 1986, the battle came to a head with a student-organized referendum. In an open letter before the vote, Sinsheimer spelled out his opposition to the slug. "As a symbol of our athletic ambitions," he wrote, "consider that the banana slug is: spineless (ipso facto), yellow (cowardly), sluggish (slow of foot) and slimy (enough said)." The vote: 5 students to 1 in favor of the slug. Sinsheimer relented. Since then, Santa Cruz's banana slug has become a celebrated college mascot, named among the best in the nation by Readers Digest, ESPN, and Sports Illustrated. Sinsheimer came around too. He featured the banana slug on his retirement invitations.